Here's why P&G might be an ideal addition to your investment portfolio. Procter & Gamble (NYSE:PG) stock hasn't attracted much investor interest lately. Shares underperformed the market in 2016 and are up only 25% over the last five years, compared to a 60% spike for the Dow. I recently highlighted a few of the reasons why investors could be right to stay away from the consumer goods giant. But there are two sides to every trade, and so today I'm looking at three powerful reasons to buy P&G stock now. Procter & Gamble dominates the markets in which it competes. Its collection of blockbuster brands includes franchises such as Gillette, which gives it an amazing 65% of the global share of razors and blades. Pampers, its biggest single brand, is worth $9 billion in annual revenue. And P&G is the global market leader in laundry thanks to the Tide, Ariel, and Downy brands that account for about 30% of all spending in the segment. Bounty paper towels soaked up a whopping 40% of U.S market share last year. Those enviable market positions aid the business in a few key ways that pay dividends to long-term investors. For one, P&G's sales don't swing wildly with economic cycles. Even in times of extreme stress, like last year's global growth slowdown and foreign currency dislocations, operating results tend to churn higher. P&G posted a 22% spike in operating income in fiscal 2016 as organic sales ticked up by 1%. Market leadership also comes with significant scale advantages. With one of the world's biggest advertising budgets, P&G supports its brands in ways that no other company can hope to match. And in recent years it has coupled that marketing strength with a highly effective sampling program that puts millions of its products into customers' hands on a trial basis. Seventy percent of new moms in the U.S. received free Pampers last year, and nearly 80% of young men tried a Gillette Fusion razor around their 18th birthday. While sales growth rates might stay sluggish for the foreseeable future, P&G's upcoming profit gains are likely to be far more exciting. The company has already sliced billions of dollars out of its annual expense structure, greatly simplified its supply chain and manufacturing processes, and removed layers of complexity from the operations. Until recently, those improvements haven't made a big impact in operating results due to the offsetting headwinds of foreign currency moves and brand divestments. But its most recent quarter hinted at the types of accelerated gains investors should see in the future. Core gross margin jumped by over 1 percentage point to boost adjusted earnings by 12% in P&G's fiscal first quarter. The company's long-run target is profit growth in the mid-single digits and, while it fell short of that goal in each of the last two years, a stronger brand portfolio, coupled with lower costs, make it likely that it will meet or exceed that target in the future. Even as sales fell by 8%, P&G showed off its power to generate gobs of cash last year. 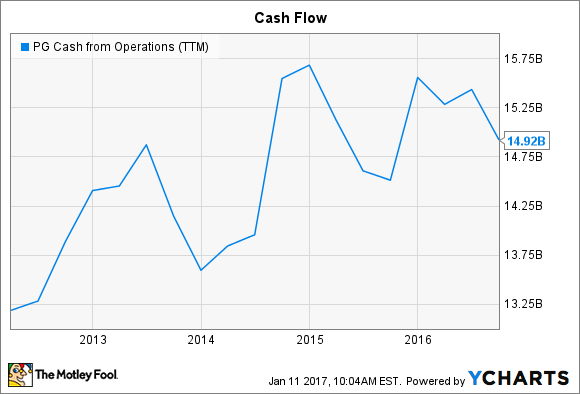 Operating cash flow improved by 6% to pass $15 billion as the company converted well over 100% of its earnings into cash. This productivity delivers plenty of funds that management can plow back into growth initiatives like research and development and marketing, and it also means gushing cash returns to shareholders. The company is on track to send $22 billion to its investors this year and over $15 billion in each fiscal year through 2019, mostly through stock buybacks. As a result of that focus on share repurchases, income investors might be left wanting more from a P&G investment. And if you're looking for market-thumping sales growth rates, you are likely to be disappointed with this stock. But there's a lot to like about P&G for investors seeking strong cash flow, rising profitability, and a rock-solid market position.